I was searching for detail to help me understand the area of Cleveland I want to model. On of the first things discovered in a large folio of N&SS maps was a beautiful vellum map of the N&SS system. While not dated, other maps bearing later dates seemed to use this vellum map as a starting point for updates. One map was marked 1919 with a revision box of dates between 1949 and 1952. As the vellum map has original names of many Cleveland steel operations, I suspect it pre-dates the mid-1920s. The detail on the map illustrates the trackage in the area I want to model. Here’s that spot again. Starting on the left, the sceniced layout will begin as the N&SS crosses Broadway. Follow through towards the rail crossings then take the connection with the W&LE and follow to East 93rd Street, where the sceniced railroad will end. The PRR will be a non-functioning double-track cutting through the center of the layout and dividing the focus between the N&SS on one side and the W&LE on the other. Portions of the American Wire & Steel Newburgh Wire Works will be behind the scene and served by the N&SS and W&LE. A couple of small industries will also be served. While these are located on the N&SS just before the area of the layout, the S.F.K. Barrel Company and the W. H. Snell Company coal yard may be modeled as scenic and operational features for the N&SS. A couple of period images of these small industries encourage their addition to the plan. The barrel company and the coal yard were located along the N&SS between the crossings of Broadway and Harvard. In the image below, the foreground street is Harvard. Note the painted sign on the coal dealer and the N&SS loco on the right about to cross the bridge. These two images are from the Cleveland State University Library and the Cleveland Memory Project and used with permission. A roll of N&SS engineering drawings was also reviewed. These date from 1949 with revisions in the early 1950s and have a similar look as valuation maps, but I am unsure if these were produced for valuation purposes. Lots of great details were gleaned, especially the N&SS connections and scale footprints of the steel facilities served by the N&SS. 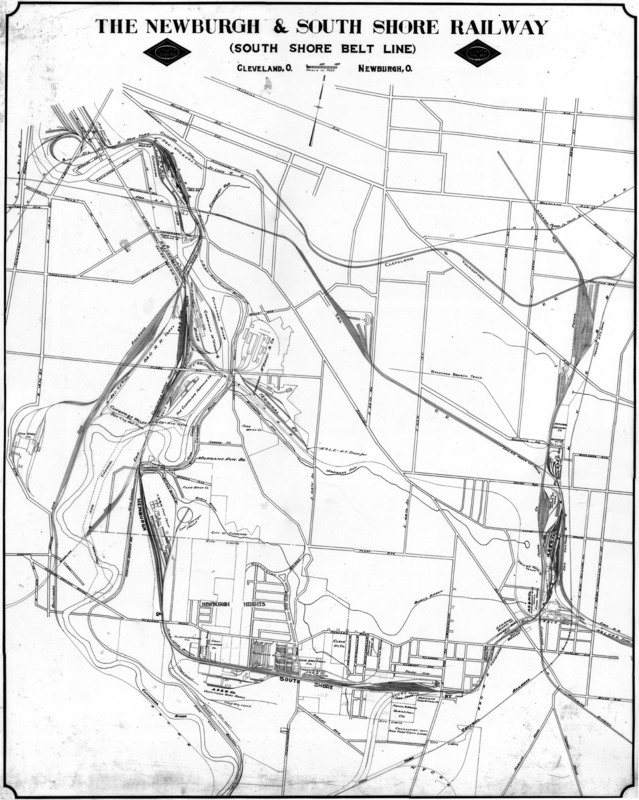 Here is a small portion of one map illustrating details of the Cleveland Furnace operation. This was at the other end of the N&SS along the Cuyahoga River. I posted additional larger images of the Cleveland Furnace available through links on my page of finds. These images were taken with a camera but they are the full size files. The N&SS maps were a fabulous find, especially the original vellum. I splurged for a full sized reprint and a digital file on disc. Only recently did I realize how the original N&SS map also shows the relationship and location of all the major Cleveland steel plants of the early days. Lake Erie and downtown Cleveland are just beyond the map, less than a mile to the north. The W&LE archive holds about 1700 images in 18 boxes. Additional materials remain uncataloged. I reviewed 300-some images in four boxes that were mainly on the Cleveland Division of the W&LE. There was much to see but little that applies directly to the short stretch I plan to model. There were a couple different views of the East 93rd Street depot but nothing else documented until the office at the junction with the Cleveland Belt & Terminal line down in the Cuyahoga Valley. There were some interesting finds, such as an image of the small Chagrin Falls yard, the Canton freight house, and some industrial areas of Canton. In many cases, older freight cars and locomotives in the background of the images were more exciting for me than the foreground content. but that is part of the research process. You may not find exactly what you are looking for, but it can be just as interesting stumbling onto other details. Which brings up one last point that I stumbled across this past spring when I attended a small prototype modelers meet in Marion, Ohio. The restored depot there is a real jewel and trains are constantly rolling by on one of three different routes. Inside the depot is an amazing display of hardware from retired interlocking tower facilities from across Ohio. These model boards, levelers and machines once guarded many places where more than one railroad crossed another at grade. I was snapping images for a friend who has a major interest in these facilities when I saw something that looked familiar. I could not quite place it, but then reality snapped into place and I gasped with delight. Before me was the original model board once used in the interlocking tower that stood among the tracks of the N&SS, W&LE, and PRR in Newburgh, Ohio. This thrilling moment of discovery adds another layer of understanding to my project. The angled track is the N&SS, while the W&LE cuts through from bottom to the top. The multiple parallel tracks are the busy C&P line of the Pennsylvania Railroad. North is to the left. Please leave your comments below. All comments are reviewed and approved before they appear.